Great tough ride out in the hills. I can’t actually recall getting home quite as shattered, er, um, well, since last time (after a ride that is, my clubbing excesses must be the subject of another post). 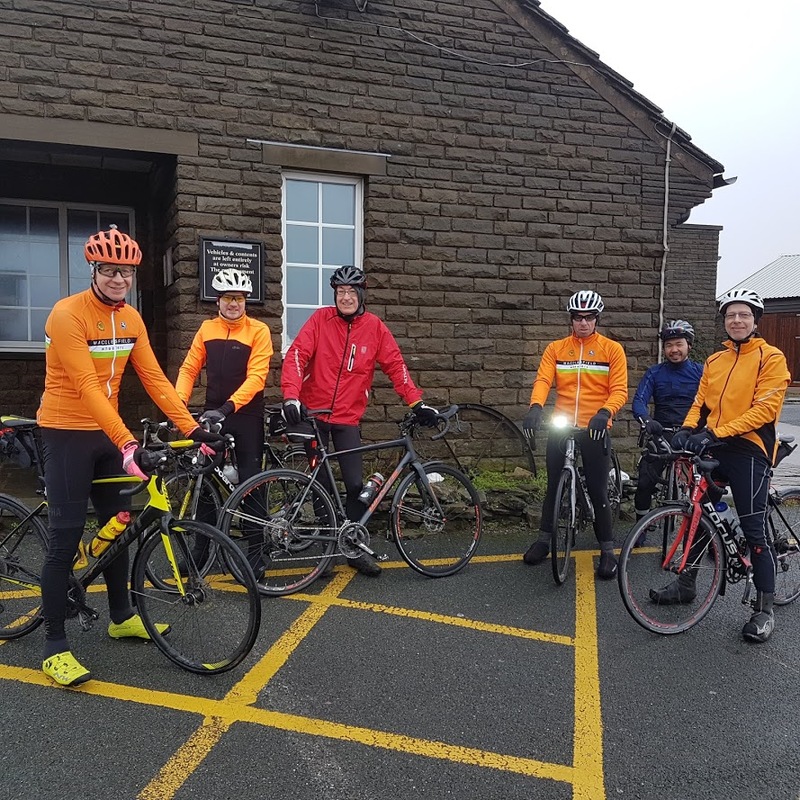 I blame the return leg headwind all the way from Eyam to Doveholes, although we were all already more than ready to refuel by the time we reached the Eyam Tea Rooms at 12.50, nearly three hours after our Grand Depart from the charming Le Petit Frog mobile cafe in South Park. Sheltering from the wind at the top of the Cat. Mark, Simon, Steve, Christian (welcome to the Lark Ride Christian, very strong rides by you and Mark today), Bennet and Jochen. Future historians of the club compiling what will surely be a bestseller at The Works Macclesfield, ‘Confessions of a Ride Leader’, should note that I flexed the route en route to omit Standing Stone on the way out on account of the wet condition of the road surface, and to omit the Cowlow Lane loop on the way back on account of the wet rag condition of the ride leader. At the summit on Monsal Head: Mark, Jochen, Bennet, Christian, Simon and some old buffer. Can’t see what all the fuss is about, seemed quite easy to us going down it. Baked bean assisted euphoria at Eyam Tea Rooms. Still smiling on the return leg (but there was still some way to go). I returned home at 4.15 after 60 miles at an average of 11.5 mph and more than 5,500 feet, to my usual hero’s welcome “you’re doing too much”, certain that I would happily have gone round twice rather than endure the hell of a pre-Christmas Saturday at The Trafford Centre. Yes of course there’ll be a ride next week. It’ll be my 65th birthday so I get to choose where we’re going, er just a minute, don’t I do that every week? Do join me. Other pensioners particularly welcome.